Floating Anvil, originally uploaded by Zach Inglis. Seen above London, England one afternoon last month. Where do you think it came down? And when it did, was it with a gentle thud or with a terrible bang? No one dared walk underneath it, that's for sure. Many people I meet in the horse world are shocked and even a bit put off sometimes when they first learn that the FEI does not allow horses to compete on even the smallest amount of non-steroidal anti-inflammatory drugs (NSAIDs, pronounced "en-saids"). If it's ok for horses in the United States to race and show on Bute and other NSAIDS, why are the other countries so backward? Whether it is horse racing or horse sports like eventing, driving, showjumping and dressage, the world's perception of horses competing on even the lowest dose of therapeutic medication are polarized. Last week's congress on NSAIDs, organized by the Federation Equestre Internationale (FEI) in Lausanne, Switzerland, was designed to fully educate all interested parties before the FEI's General Assembly vote in November which will ask the world's equestrian bodies if it would like to liberalize the FEI's NSAID policy by going with a "progressive list" of allowed medications for competition horses. Much of the NSAID Congress was scientific presentations by leading experts like the USA's Dr. Wayne McIlwraith but there were some ethical considerations as well. So far, the FEI has posted 12 videos of lectures from the Congress on YouTube for us to watch. That's a lot of pharmacology research. But perhaps most important of all the lectures was a bit of a history lesson from horse welfare specialist veterinarian Alex Atock of Ireland, who was in the middle of the FEI's upheaval over NSAID reform in the late 1980s and early 1990s, when he served as head of the FEI's veterinary department. Bute was banned under Alex Atock's watch; who better to take us back in time to find out when and why the ban was initiated? 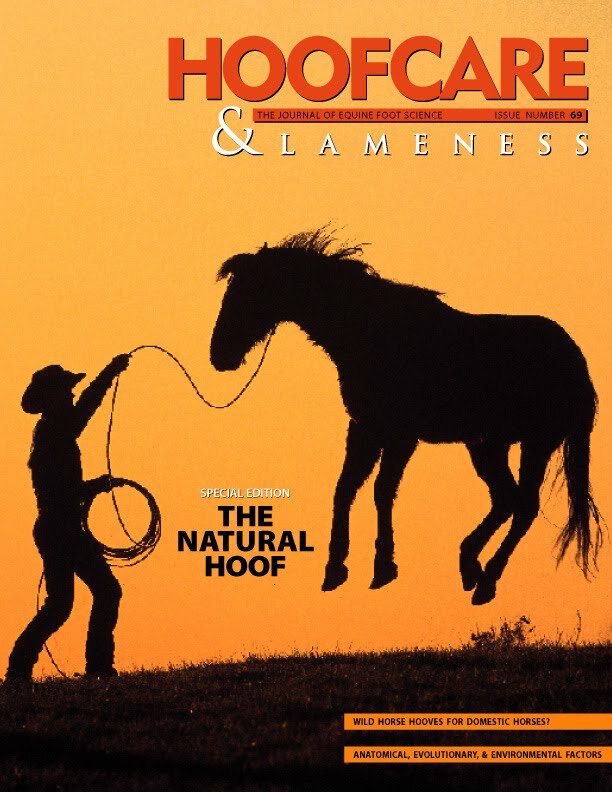 Listening to this video, I felt like I was thumbing through old issues of Hoofcare & Lameness. As the FEI strugged with the issue of banning Bute, I was writing about it, and about all the horror stories that were happening in the horse industry at the same time. Were they related to Bute? No, but they were related to horse welfare and the perception that people in horse sports had little regard for the well-being and even the lives of their horses. Somehow, this all spilled over to the drug debate, though. As Atock says, we had German pole rapping scandals, American insurance-collecting horse killers, and the 1990 Breeders Cup had been called the blackest day in horse racing history, as three horses were euthanized as a result of breakdowns in one day's races, including the magnificent three-year-old filly Go For Wand. It's amazing horse sports of any kind survived that era. The FEI's decision to completely ban Bute from competition horses was painful. It has been painful all along the way since then, but never more painful than the past year, when the old dichotomy opened up again. Which way will the FEI vote in November--with the liberalized science-is-God view or with the welfare-ethics old guard of Europe who staunchly maintain that Bute and NSAIDs were banned for a reason and horse sport needs to distance itself from the perception that equine athletes are drugged in order to perform? Does a horse on Bute deserve a Gold Medal if the Silver goes to a horse that is "clean"? On the other hand, should a horse be forced to withdraw from a world-championship competition because of a minor episode of colic a week beforehand that has nothing to do with a performance-enhancing effect of a drug that could be given to treat the colic? Should a vet have to hesitate to medicate a horse because of the performance-drug testing repercussions of a therapeutic substance? These questions go around and around and around. By way of education, here's a clip from a lecture by USEF veterinarian Kent Allen, explaining to event riders how to fill out forms to report the NSAID(s) their horses are on, since the USEF rules were changed this year. This clip is one of a 24-part YouTube series with Dr. Allen presented by US Eventing and sponsored by SmartPak to help riders through the process of understanding what is permissable for their horses and how to manage their horses within USEF rules while competing at USEF (as opposed to FEI) events. 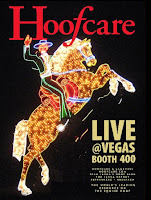 That's right: 24 videos to explain how to manage your horse's medications within the rules, and to help riders understand the issues and regulations surrounding the approved and unapproved medications themselves. Dr. Allen is chairman of the USEF Drug and Medication Committee and vice-chair of the FEI Medication Advisory Group. He is also official Veterinary Coordinator of the 2010 Alltech FEI World Equestrian Games. It is of critical importance to him that riders and trainers understand the medication process and that the American horse public understands the reasoning behind the USEF policies, which are different from the major European nations, but in line with some other countries around the world. The one-med-or-two forms explanation is vaguely reminiscent of some of my phone calls with Blue Cross Blue Shield about my HMO care. I highly recommend that ANYONE who even thinks of commenting one way or the other on the medication debate in the FEI watch all the FEI NSAID Congress videos AND Dr. Allen's USEF rules videos. Educate yourself before you speak. The FEI and US Eventing have laid out a great menu of education for you, for free. You don't have to buy airplane tickets, stay in hotels, or sit all day in uncomfortable chairs. Just watch and listen and learn about medication rules, here, there and everywhere. What do you want the future of the horse world to be like? How do you think international horse sports will be perceived if medications are allowed? Most importantly, now that Alex Atock has reminded us where we have been, and opened up the closet where the skeletons have been hiding, where on earth is all this going? VW Farrier Rig 8, originally uploaded by parmo. The sun will never set on the utilitarian design of the Volkswagen Beetle. But as a farrier shop on wheels? It looks a little dangerous with that propane tank wedged in there like that, when you know there's nothing in the front of a Beetle, but forget about that and just enjoy this beautiful portrait of a beautiful car by our long-lost friend David, who knows a thing or two about farriers. Background: In November, the Federation Equestre Internationale, the world governing body of horse sports, will convene its General Assemby in Taipei. On the agenda is the groundbreaking and emotional vote whether or not international horse sports should allow horses to compete on low levels of mild anti-inflammatory medication, similar to what is now allowed in the United States. Currently the FEI operates under a zero tolerance policy, which is in keeping with many nations' national policies and even legal statutes. An attempt to pass this important rule change at last year's General Assembly was clouded in confusion and resulted in international furor that led to a decision to reconsider and re-vote in 2010. To make sure that the latest information was available to all voting nations, a congress convened in Switzerland last week with leading veterinary experts. For this reason, the Alltech FEI World Equestrian Games in Kentucky next month will be competed under current FEI rules. Had last year's attempt passed permanently, horses from all over the world would have come to the USA and perhaps competed on medication for the first time in their careers, much like the international racehorses who come for our Breeders Cup. Some countries had grumbled about boycotting the 2010 WEG if the drugs were allowed. An emotional issue? It's hard to think of a more hot-button issue in international sport or racing. It is what sets the USA apart from the rest of the world. We think they should be like us. They think we should be like them. And so the world goes round. 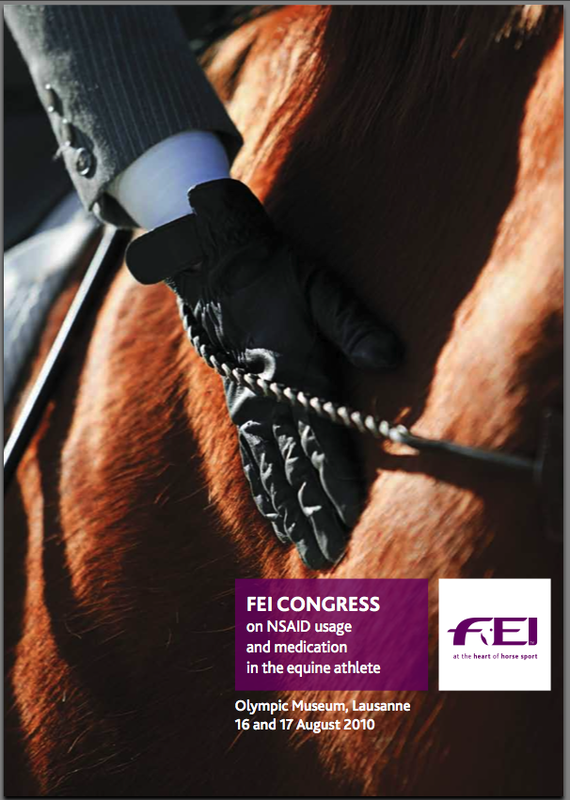 Last week's FEI Congress on Non-Steroidal Anti-Inflammatory Drugs (NSAID) Usage and Medication in the Equine Athlete has been called an invaluable contribution to the debate on the in-competition use of NSAIDs. 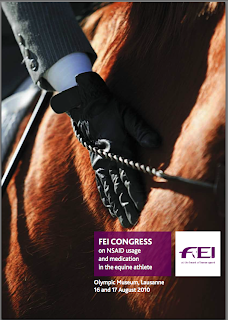 In a ground-breaking approach by the FEI, the Congress brought together both the most up-to-date scientific data and non-scientific aspects of NSAID usage for over 200 delegates from 29 countries at the two-day Congress, which was held at the Olympic Museum in Lausanne, Switzerland. The second day of the Congress clearly demonstrated that this is a debate that cannot be viewed purely from a scientific perspective and that ethical values and legal issues also have to be taken into account. Following Monday’s mainly science-based presentations, FEI General Counsel Lisa Lazarus opened Tuesday’s session by outlining details from nine European countries that prohibit or may prohibit the use of NSAIDs under national law. In light of these legal issues, Ms Lazarus stated that the FEI has two options: either abandon any proposed change in the treatment of NSAIDs, maintaining the status quo that NSAIDs cannot be administered to sport horses during FEI competition anywhere in the world; or permit the use of NSAIDs at appropriate levels as far as the FEI and its members are concerned, but make it clear to all athletes and participants that the FEI’s rules do not supersede national law, and that anyone participating in the sport in any of the nine countries must note that national laws prohibit, or may prohibit, the use of NSAIDs. Stephen Schumacher, Chief Administrator of the Equine Drugs and Medications Program of the United States Equestrian Federation (USEF), stated that the USEF Equine Drugs and Medications Rules allow NSAIDs usage with quantitative restrictions. “We believe that the welfare of our horses is not put into jeopardy with the judicious use of NSAIDs and their use may in fact be beneficial,” he said. Dominik Burger, President of the Veterinary Commissions of the Breeding Associations for Swiss sport horses, spoke on the breeding perspective. He concluded that the issue would benefit from a pluralistic ethical analysis based not just on the welfare of horse and rider but also on regional and global public values like integrity, equity, justice, duties and responsibility. 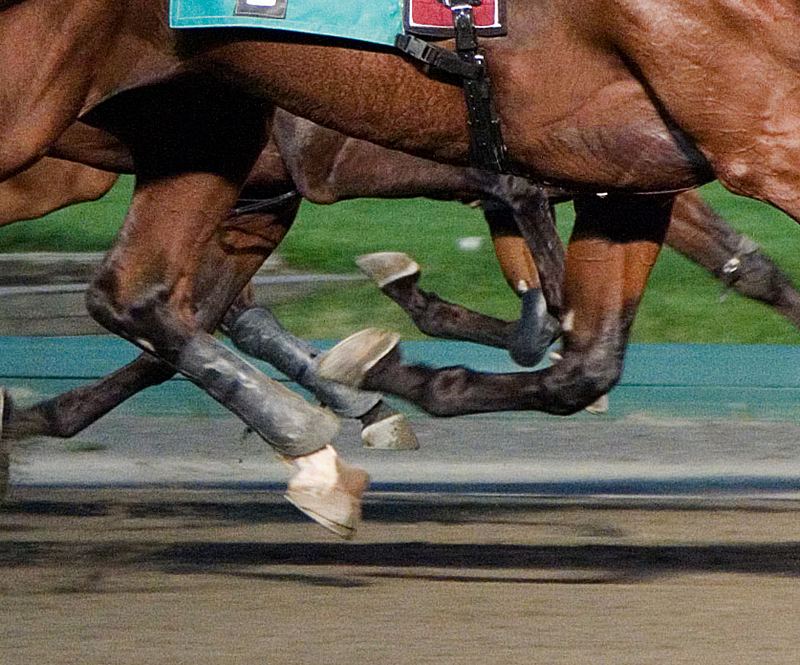 Steve Maynard, Laboratory Director at Horseracing Forensic Laboratory Sport Science, outlined that quantitative analysis, applied to determine the exact level of a substance being present in the body, is significantly more costly than qualitative analysis carried out to detect the presence of a substance. The public perception of equestrian sports, sponsors and the media perspective were all aired in Tuesday’s panel discussion, when British journalist Brough Scott asked some hard-hitting questions about the possible repercussions of reintroducing NSAIDs in competition. Sven Holmberg, FEI First Vice President chaired the final debate on the pros and cons of the in-competition use of NSAIDs. Tim Ober (USA) and Mike Gallagher (CAN) spoke for the use of NSAIDs and Peter Kallings (SWE) and Christian Paillot (FRA) spoke against their use. FEI Veterinary Director Graeme Cooke, who had earlier updated participants on the work of the FEI List Group, summarized both sides of the debate, drawing on key points from all the speakers over the two days. The FEI has achieved a number of key objectives through the Congress, he said, gathering up the science that had become available since 1993, bringing together the scientific and non-scientific, providing an opportunity to hear related views, and ensuring there will be a record of this unique event in order to inform not just National Federations, but everyone with an interest in the debate and allowing for further review before the FEI General Assembly in November. In his final summing-up, Holmberg stressed the importance of keeping the debate alive between now and the vote on in-competition use of NSAIDs in November, so that the decision taken at the FEI General Assembly is one that is founded on sound knowledge and in the best interest of the sport and the horses. “There is no doubt that both sides of the Atlantic and the rest of the world have the same clear goal in mind: that the welfare of the horse is really paramount to whatever we do,” he said. A report on the Congress will be sent out to all National Federations, and the FEI website will continue to offer a feedback area for comments. To maintain the flow of information for National Federations that were unable to attend the Congress, videos of all speeches and power point presentations, as well as the panel sessions and full debate, will be made available on the FEI YouTube Channel later this week. I'm glad I watched this video. Now I have a new yardstick for judging change in the horse world. They say people are in and out of the horse business; Jim Kline says he hasn't been taking on any new customers for the past 20 years or so. There might be people hanging onto their horses just so they won't fall off his client list. Does that sound like a successful horseshoer to you? I think it should. Jim lives in a nice part of the world, the Hudson River valley, a few hours north of New York City. His territory would be the magnificent hunt country and Thoroughbred farms of Millbrook and Rhinebeck, rolling into the Litchfield hills of Connecticut. I don't know what you will get out of this video; it's a little snapshot of a few minutes spent with one of New York state's senior farriers, but he offered a lot of food for thought for me. "Thought" is a word that is easy to connect with Jim, because he thinks a lot and I always stop and listen when he speaks because I know he's been pondering things. If you ever have the chance to meet him, you'll be glad you did. You can ask him about almost anything and you're sure to get an answer back that will turn around and put you to the test, whether you ask Jim about Thoroughbred feet or what's for lunch. This video accompanies a feature article about Jim that was in the Poughkeepsie (NY) Journal today, along with a beautiful photo of him. Sometimes I cringe when I see these articles and wonder if the journalist knew just who he or she was interviewing but this piece is great--Jim just talked about what it's like to be a farrier in one of the best places in the world to be one. And the reporter had the good sense to just write down what he said. Watch the video, read the Poughkeepsie Journal article, and get to know Jim Kline. Hoofcare @ Saratoga Presents Ada Gates: "The Blacksmith Was a Debutante"
Ada Gates Patton clowned around at Del Mar with some of her shoer pals before heading east. 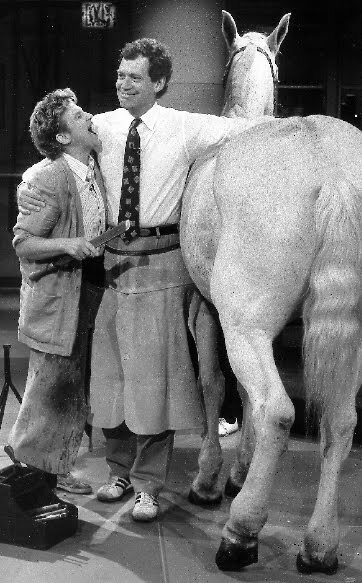 I guess there was no way this would be a serious photo; Ada climbed onto Ron McAnaly's stable pony and wielded a rasp. Why does this shot have a hint of Broadway to it? Can these guys shoe and sing and dance? Hoofcare @ Saratoga is ready to do it again! We'll follow up last week's successful and hugely educational "Rood and Riddle" night with star farrier/veterinarian Raul Bras with something entirely different. Entirely different from anything you've ever heard. Ada Gates Patton is traveling east from California as I write this. She's aiming at Saratoga, where she will touch down at the Parting Glass Pub at 7 pm on Tuesday, August 24. 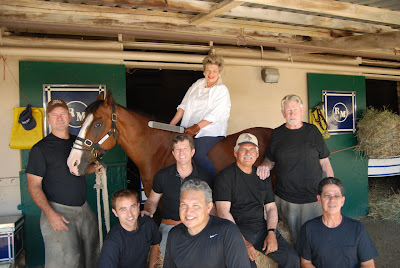 She has an entertaining program plan, based on her retrospective journey through almost 40 years as a farrier, and particularly as the first woman to be licensed to shoe Thoroughbred racehorses in North America, and perhaps even in the entire world. 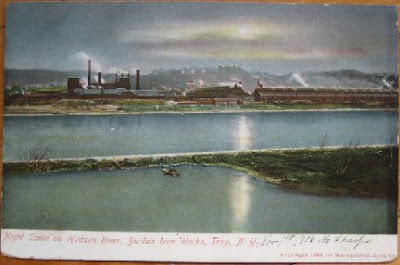 Some special guests are scheduled to stop in; among them Dr. Tom Carroll of the Burden Iron Works horseshoeing factory museum in nearby Troy and a host of local horseshoers, many of whom have heard of Ada, but never met her. Please join us! The setting is informal, you can order food and a drink (or not), there should be plenty of free parking, and we're going to have some laughs and also do some serious talking about hoofcare. Where were you the night when farriers stayed up late to watch one of their own on the big stage in New York City? The night one of their own left the great David Letterman speechless? The night David Letterman lost control of his own show? Ada Gates Patton is in a league of her own. The fact that she was the first woman licensed to shoe horses at a racetrack in the United States is only the beginning of the story. A few years ago, we were in Kentucky for a convention and she made a special trip to Three Chimneys Farm to visit Wild Again, one of the horses she shod back in the 1980s, when he won the Breeders Cup Classic. Ada was international horsemen's liaison for the Breeders Cup in California, and coordinated farrier services for the 1984 Olympics in California. 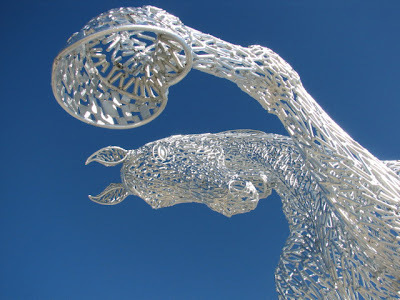 Ada is originally from New York; she is a descendant of Henry Burden, a Scottish immigrant who invented the first machine to manufacture horseshoes. His machines are credited with helping the North win the Civil War; his factories stretched forever along the banks of the Hudson River in Troy, New York and Burden horseshoes supplied the US cavalry for decades. Today, Ada owns and runs Harry Patton Horseshoeing Supplies near Santa Anita, and serves farriers all over California. The business was started by her late husband, the famous racetrack mentor and long time Santa Anita paddock shoer Harry Patton, and she has built it into a multi-store retail chain, with business partner Michael De Leonardo in northern California. 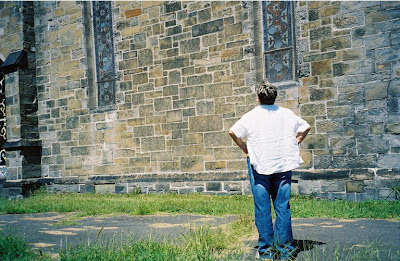 Ada stares up at the derelict but grand church built by her great-great-grandfather in Troy so that horseshoe factory workers had a place to worship. She saved the church from demolition through a loophole in the deed that made a provision for a descendant of the founder to lay claim. 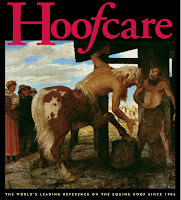 What would Henry Burden think of one of his descendants selling horseshoes? Ada is originally from New York, and she is the great great grand-daughter of Henry Burden, the inventor of the horseshoe-making machine. We reconnected her with her roots a few years ago by explaining that her family's church would be torn down if she didn't claim the deed and save it--which she did, and subsequently opened the beautiful old church and invited our Hoofcare@Saratoga tour group of farriers in for lunch as part of one of our tours of the Burden Iron Works. 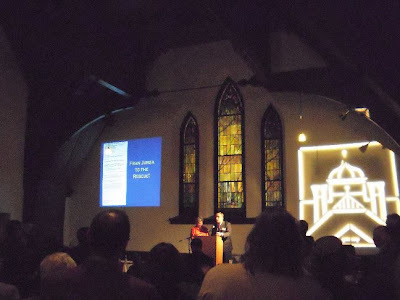 Last year Ada was honored in her family's church by the Burden Iron Works Museum and its preservation efforts. The image at right is the outline of the Burden horseshoe company's office building, which now houses the museum. The museum and Ada found each other through Hoofcare & Lameness Journal and our Hoofcare@Saratoga program and tour of the museum. The museum is dedicated to preserving the history of horseshoe manufacturing in Troy, New York. Today, Ada is busy selling shoes. 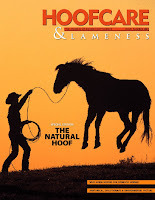 But she recently "joined up" with one of her old shoeing clients, California horseman Monty Roberts, and the two made a DVD together on hoofcare and horsemanship for hard-to-shoe horses. Ada also teaches simple hoof balance principles at horse owner events and markets a hoof ruler to help them keep track of changes in their horses' hooves' dimensions. Horse Illustrated profiled Ada's pioneering career spirit in this tribute article. They named her one of the 20 most influential women in the horse world in the previous 20 years. Ada is one person who never forgot where she came from, and is not done getting to where she's going. She's still giving us all a lot of laughs along the way, and digging this Letterman video up out of the 1990s will insure that more people around the world join in. Join us Tuesday, August 23rd, 7 p.m. in the back room at the Parting Glass Pub, 40 Lake Avenue, Saratoga Springs, New York. The pub is one block off Broadway; Lake Avenue is also Route 50. 1. Some off-street parking is available; it shouldn't be difficult to find a space. 2. The Parting Glass is one block off Broadway (Route 9, where the shops are), and it is opposite the Hampton Inn. Lake Avenue is also Route 50. Phone for restaurant-related questions only is (518) 583 - 1916. 3. We begin at 7 and end sometime around 9 but the pub stays open very late. 4. The pub accepts credit cards and dress is casual. Ordering food is not required. If you could introduce yourself or say hello at some point, and sign the guest book, that would be great. 5. There is never a charge for the presentations. It is just something that Hoofcare Publishing likes to do. The horse industry needs the kind of information that our top-shelf speakers can provide and it is our mission to keep the best information in front of the people who want to hear it. 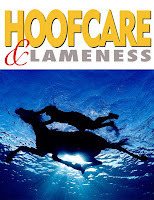 Hoofcare Publishing thanks the Parting Glass Pub, Frieda and Cliff Garrison, Jim Santore, Skidmore College, and every horse in town for welcoming Hoofcare back to Saratoga. Last week was terrific but I have a feeling that this week won't be quite so laid back! I imagine a scene something like this: the pubkeeper comes out on the sidewalk to speak to the visitors staring at his sign. "Come in, come in," he says. "We're open!" But they just keep staring at the sign, as if they haven't even heard a word he just said. Finally one snaps out of his stupor and says, "Nah, we don't want a pint, we just came to see your pub's signs." It could happen, you know. This old pub is in a village that was once on the main route between Exeter and Plymouth on the coast. The pub door opens right out onto the street. Mail coaches and freight wagons must have passed by here, bringing and taking all that would sail on the seas. The coach road is now the A37 and the big motorway passed the village of Ivybridge by, and the smithy became a pub. Perhaps the smith went from tending the fire to tending the bar. Someone somewhere along the way commissioned some worthy artwork to commemorate this building's hard-working origins. And it's well done. Checking the Fit, originally uploaded by CowCopTim. Something about this photo just grabs me. It's another of those, "Huh!" sorts of photos. A photographer frames something we see often in a way that makes it interesting and visually compelling. And makes it look pretty dangerous! Photographer Tim Dawson had a wonderful time at the New Zealand Farriers Association's North Island Dairy Flat Forging and Heavy Horse Competition in Auckland on July 23-24. While I try to figure out which farrier this is, I will let you enjoy the shot. 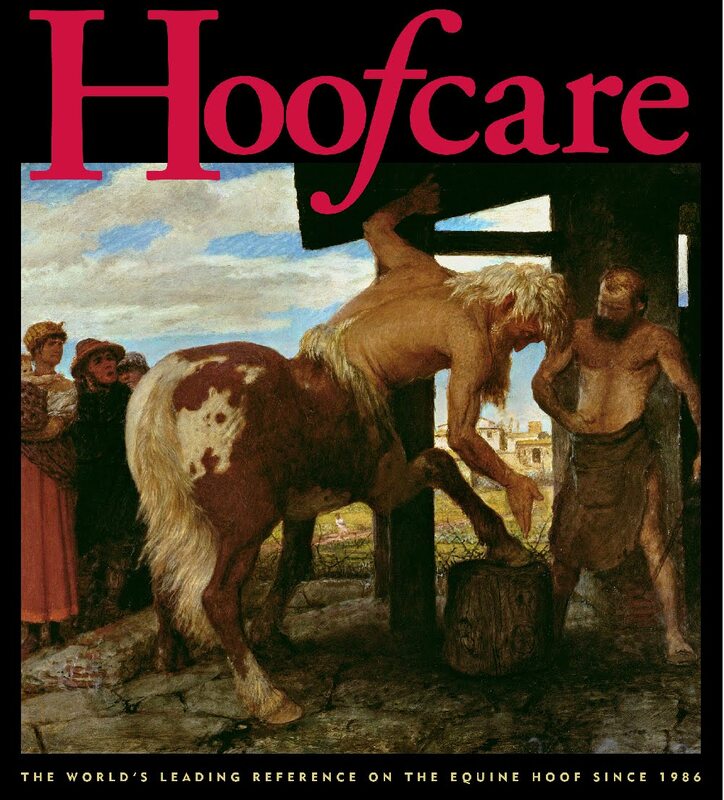 For the uninitiated who may have stumbled upon this image, you are looking at the age-old act of a hot horseshoe being pressed against the trimmed bottom of a Clydesdale's hoof. The farrier will hold it there firmly for a few seconds (no, it doesn't hurt the horse) while it gives off some acrid sulphurous smoke. Then he will pull it away and observe the hoof to see if the burn mark is uniform around the wall of the hoof. This will tell him if the shoe is level; without a level shoe, the nails won't be tight and if the nails aren't tight...well, you remember the old "All for want of a horseshoe nail" ditty. This process is called "hot fitting" and it is done for all types of horses. It is even done for Thoroughbred racehorses, though they wear thin aluminum shoes that can't be heated and pressed. I don't think it has been scientifically proven, but it is widely believed that feet that have been hot fit hold together better because the horn tubules are somehow "sealed" by the heat and they keep out bacteria or there is some other beneficial effect that protects the hoof wall. But nothing is quite as dramatic as hot fitting a Clydesdale. The Clydesdale competition was won by Grant Nyhan, Marcel Veart-Smith and Deane Gebert. Thanks to Tim Dawson for allowing this photo to be shown on the Hoof Blog today. Irish farrier Damien Gallagher let some sparks fly when he learned he would be coming to America as the guest of Alltech to attend the World Equestrian Games next month. Damien Gallagher, a farrier from remote County Donegal in northwest Ireland, will be coming to the Alltech FEI World Equestrian Games next month at the Kentucky Horse Park in Lexington, Kentucky. No, he's not one of the Irish team farriers. 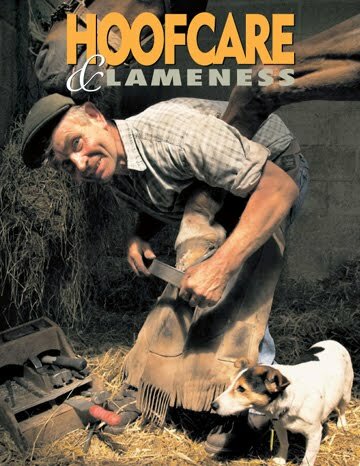 No, he's not a personal farrier to an Irish rider. He won't be packing an apron, and he probably won't be checking a toolbox through customs. What he will be is a VIP. Damien is on the list to be a guest of Alltech, title sponsor of the Games and international horse feed manufacturer. 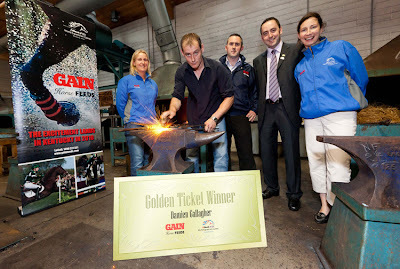 Customers were invited to fill out entry forms accompanied by a “golden ticket” that was affixed to thousands of Gain Horse Feed bags in Ireland over the past number of months; the contest was to devise a slogan extolling the benefits of the feed, which is the official Irish Animal Health and Nutrition Partner of the Alltech FEI World Equestrian Games. After an exhaustive trawl through more than 5000 slogans submitted, the judges agreed that Damien’s entry best summed up the objectives and achievements that go hand in hand with Alltech and Gain Horse Feeds products. Damien qualified as a farrier in 2005 after completing the four-year apprenticeship program of the Irish Master Farrier Association. After qualifying, he set up his own business in County Donegal. 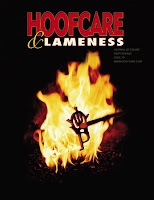 "Each year it has gradually expanded and I find myself shoeing a wide variety of horses from leisure to competition horses," Damien told Hoofcare and Lameness by email. "I always enjoy working on our native breeds--namely, the Irish draught and Connemara pony--and look forward to our summer when I get the opportunity to carry out corrective work on foals. I mainly work from a mobile unit traveling from yard to yard. "Both my wife and I are active members of the Letterkenny riding club," Damien commented, regarding his own involvement with horses. "Although we only compete at amateur level we take great enjoyment from show jumping, cross country and dressage." "My wife, Nadine, and I will be in Kentucky from the 5th to the 11th of October," he said. "I would love to meet up with some American farriers." The 2010 World Equestrian Games, by the way, might be quite naturally linked to Ireland; title sponsor Alltech has its roots in Ireland, where its founder, Dr Pearce Lyons, was born. Thirty years ago, he established his animal nutrition company in Kentucky and the rest is history! Alltech now has headquarters in the USA, Ireland, and Thailand. The Games will feature an "Irish Village" promoting Irish horses and horse culture in addition to many more exhibits and pavilions. Damien should feel right at home. Good news for hoof research: this week the Arabian Horse Foundation (AHF) of the Arabian Horse Association (AHA) announced that it awarded $5,000 to fund equine research; the Foundation directed $2,500 to Cornell University. The $2,500 to Cornell University will go toward research into Equine Metabolic Syndrome (EMS) and Equine Cushing’s Disease (ECD) in the Arabian horse. The grant will fund the work of Dr. Samantha Brooks and Cassy Streeter. A frequent complication of both EMS (also known as Insulin Resistance) and ECD is laminitis and laminitis, in turn, is one of the most common causes of lameness and death in the horse. 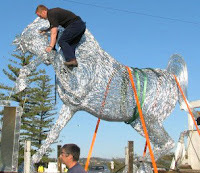 The metal sculpture "Scotty's Arabian Horse" shown in this article was constructed by hammer on galvanized steel for the Swell Sculpture Festival on Currumbin Beach on Australia's Gold Coast by Andy Scott; photos top and left are by Jeannie Fletcher. I wonder if this magnificent horse and his huge hoof are still there. He was designed to bask in the sun...although he might look great in the snow, too. The photo below is from Andy's astonishing portfolio of public art. Dr. William Moyer, professor and department head of the Large Animal Clinical Sciences Department (LACS) of the Texas A & M College of Veterinary Medicine and Biomedical Sciences (CVM), will become the next president of theAmerican Association of Equine Practitioners (AAEP) in December 2010. While Moyer goes on administrative leave to fulfill his duties with the AAEP, Dr. Allen Roussel, professor and associate department head at veterinary college, will become the acting department head of the LACS on September 1, 2010 until January 1, 2012. "This is the greatest honor I have ever received," explains Moyer. "I have been a member of AAEP since 1969. AAEP has set the ground work for a lot of other organizations of its kind. It was the first to have a motto, and it is one of the only organizations that is very progressive in dealing with all issues of the horse world. Personally, AAEP is my window to the world I work in. I am very grateful to Dr. Roussel for fulfilling the responsibilities of my current position while I execute my role with the AAEP." AAEP's mission statement is "to improve the health and welfare of the horse, to further the professional development of its members, and to provide resources and leadership for the benefit of the equine industry." AAEP encompasses all aspects of the horse industry. Moyer is currently president elect of the AAEP. He received his DVM from Colorado State University in 1970. He has been the department head of the Large Animal Clinical Sciences Department for 17 years. He also holds memberships in the American Veterinary Medical Association, Association for the Advancement of Sports Potential, Association of American Veterinary Medical Colleges, Association of Equine Sports Medicine, and the Texas Veterinary Medical Association. "Dr. Moyer's rise to the presidency of the largest, most influential equine veterinary organization in the world speaks volumes about his success as an influential leader and the regard in which he is held in the profession," said Dr. Eleanor Green, Carl B. King dean of veterinary medicine at Texas A & M. "The AAEP presidency is one of the greatest honors, opportunities, and responsibilities an equine veterinarian can achieve. We are all very proud of Dr. Moyer." "As AAEP President, Dr. Moyer will advance both the AAEP and Texas A & M University," Green continued. "In recognition of the growing responsibilities and time commitment associated with AAEP Presidency, Texas A & M fully supports Dr. Moyer and encourages him to focus his talents and energies on his presidency during his term. So how can the Department of Large Animal Clinical Sciences continue to flourish during this period? Dr. Moyer fully supports Dr. Allen Roussel in serving as Acting Department Head. What speaks volumes about Dr. Moyer's selfless nature and his well-known advocacy for and faith in his faculty is that he has entrusted the department completely to Dr. Roussel. He has made it clear that he wants Dr. Roussel to lead the department as if he were the permanent department head until his return. "Dr. Roussel is up for the challenge. He has demonstrated excellent leadership as Associate Department Head and has been working side-by-side with Dr. Moyer over the last few months. One can almost hear Dr. Roussel saying, 'Put me in coach.' Because of unselfish dedication of both of these leaders, the department will not merely be held together, it will continue to drive forward." 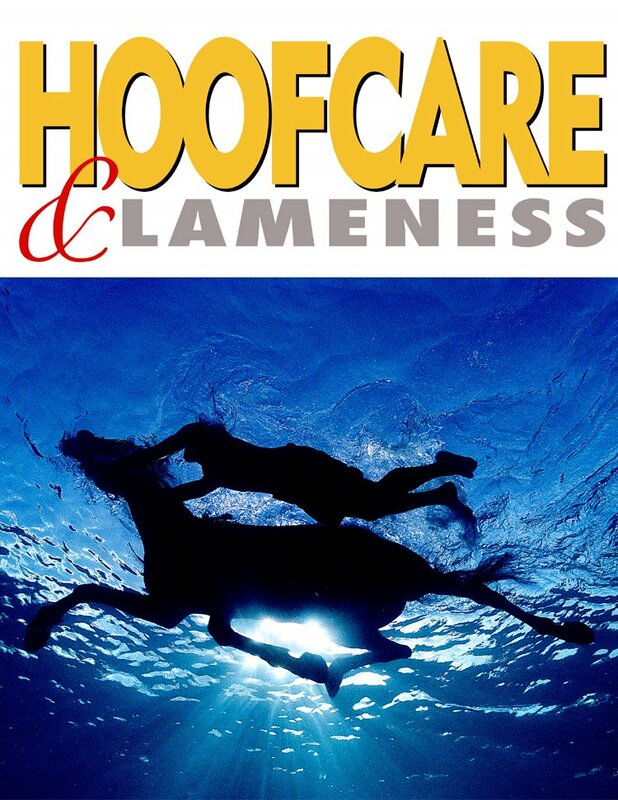 Hoof Blog note: Among his many other accomplishments, Dr. Moyer is co-author of A Guide to Equine Joint Injection and Regional Anesthesia, our current bestselling book. Sadly, it has gone out-of-print and we are down to the last copies. If you need one, please go to our order page and make sure you get one before they are gone. Also: Dr. Green knows what she's talking about; she was AAEP President in 2008. Trot on! Hambletonian Winner Muscle Massive is a Jersey Boy But Might He Be the Last? "Rumors of my death are greatly exaggerated," is a line attributed to Mark Twain. The same could be said of The Meadowlands racetrack in urban New Jersey. Rumors from Trenton this summer suggest that the governor and state legislature might like to bypass support for casino-type gambling there in favor of other venues in the state. New Jersey's horse industry--much of it based in small Standardbred racing and breeding operations--is up in arms. 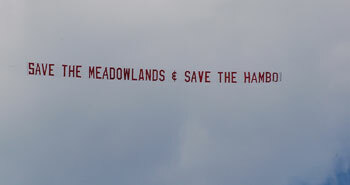 So when the $1.5 Million Hambletonian, the world's most famous trotting race, went off at The Meadowlands on Saturday afternoon, a crowd of 26,712--the highest attendance in five years--was on hand to watch, and a plane flew overhead with a banner asking them to "Save the Meadowlands". The winner of the Hambletonian, a sparkling and regally-bred three-year-old bay colt named Muscle Massive, is a Jersey Boy and could be the poster child for Save the Meadowlands. He was bred right in New Jersey, at Perretti Farms. He's the son of Muscle Yankee, winner of the Hambletonian in 1998 and sire of 2008 Hambletonian winner Deweycheatumnhowe and 2009 winner Muscle Hill. Muscle Massive clocked the second fastest final in Hambletonian history. The record was set by his sire. If the horse is sound and that fast, credit must go his farrier and this horse has a good one. Congratulations to Conny Svensson (left) on shoeing his third Hambletonian winner. He also shod Malabar Man in 1997 and Scarlet Knight in 2001. Conny's most famous charge was the great and legendary globe-trotting mare Moni Maker. Conny didn't comment about how the horse was shod--he had shod three horses in the race--but the trainer had this to say to Hoof Beats: "We raced him in steel shoes last week and I did that just for safety because he pulled a muscle, just to make sure he wouldn’t go off stride. I put aluminum shoes on him for today." Harness racing is much more popular in attendance in Canada and in Europe than it is in the United States and yet The Hambletonian is still the one that every owner in the world would like to win. International wagering was nearly $2.4 million, up from $1.97 million wagered on the 2009 simulcast. Total wagering worldwide was $8,391,600, on the full card of yesterday's races at The Meadowlands. Ah, but then in other parts of the world horse racing is often the only form of gambling, and the sport is a little more secure. Muscle Massive is owned by a consortium of Swedish and Canadian interests and trained by Swedish native Jimmy Takter, who said in an interview that if The Meadowlands closed he would probably look for a different job. A plane pulled a banner over the Meadowlands Racetrack on Saturday during the Hambletonian. The USA's richest Standardbred racetrack is endangered. It seems like wherever I go, there is a crisis in the horse industry, and it usually has something to do with expanded gambling and state legislatures. I'd like to know how much better off the states with gambling really are; I think it is too soon to tell. What I can tell is that the pressure is on. New Jersey is caught between Delaware and Pennsylvania, where gambling is in at the racetracks; it is promised to come to New York at Aqueduct, a long stone's throw across the expansive marshland that gives The Meadowlands its name. The squeeze is on. Kentucky feels the same kind of pressure. Maryland has struggled. Texas feels threatened. And here in Massachusetts, our governor flatly refuses to save racing and insists of backing resort casinos identical to the ones in the state next door. Politics and horses have never mixed, but this is the future of all the horse industry that is at stake here. When the racing goes, other services go with it. Sport horses and pleasure horses will suffer, vets and farriers will suffer, hay and grain supplies and prices will suffer. And those are just the big ticket items at the top of the list. It's one big chain of dominoes. 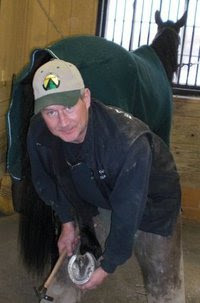 Just ask the owners of Perretti Farms, the largest Standardbred farm in New Jersey, where Muscle Massive's sire stands. Smiddy Stane: What Is this? Smiddy Stane, originally uploaded by airth_man. Do you know what this thing is? The Hoof Blog will be telling you, but I just thought I'd post this photo and see if anyone already knew. Or wanted to guess. Lisa's Booby Trap is a horse for anyone who has given up on horseracing. Or life. Photo courtesy of New York Racing Association. Saratoga. Playground of the rich and famous. Well-bred people, better-bred horses. They check your pedigree at the city line. But on Monday night, the best pedigree in the world couldn't get you to a new home; svelte yearling after svelte yearling went unsold at the Fasig-Tipton Select Sale, or sold at prices below what was expected, and hoped for. The buyers turned up their noses at the yearlings. The hottest horse in town, instead, is none other than a $2000 freakishly-fast-finishing Florida-bred Finger Lakes filly who is trained by Tim Snyder, a guy from Maine who normally wouldn't be able to even get a stall at Saratoga. The racing secretary at Saratoga does not have Tim Snyder on speed dial. The guy has one horse in his stable. But, this year is different in a lot of ways. You see, Tim seems to think the horse may be the reincarnation of his wife, Lisa, who died of ovarian cancer in 2003 and vowed she'd "come back as a horse". And then this horse showed up in his life. Lisa's Booby Trap. That's her name. The whole thing reads like a script for a video that plays inside a Hallmark card. Except it's really happening, right here in Saratoga, of all places. 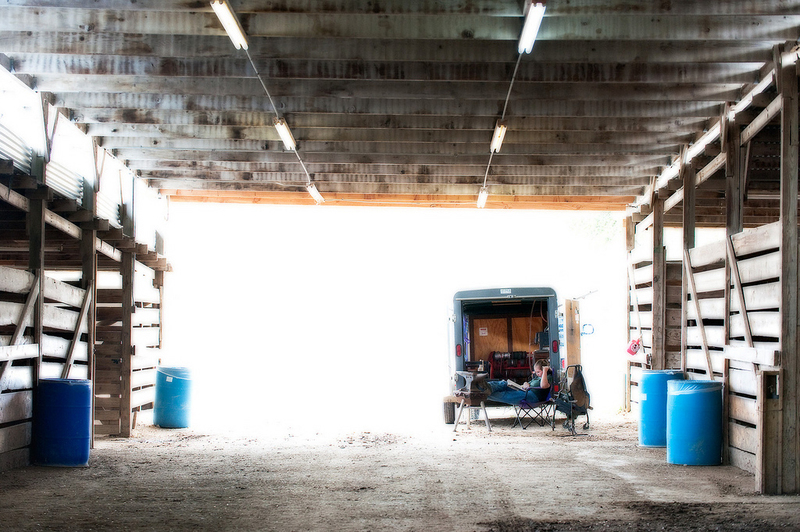 He was broke, and didn't even have a horse trailer to go pick her up when he bought her. She was club-footed, and only had one eye anyway. But, the way people tell me the story, she had not just a bad club foot but a flat pancake foot too and she needed someone to pay some attention to her hooves. According to NYRA, she wears a hind shoe on the flat front foot now. And she no longer hits herself when she runs. Tim found a horseshoer to get the job done. And now it is just a matter of waiting for Oprah to call. Here's their story, though we don't know yet what her feet look like. (I'm on it, though.) This TVG segment was made when she had won her first three starts this spring and summer at Finger Lakes, which is sort of the "outback" of New York racing, out in the middle of the state. So Tim must have borrowed a trailer or begged a ride for the filly across New York State to Saratoga. She made her workout debut during the morning trackside breakfast on the main track. The announcer didn't notice her streaking by, but the timer certainly did. That was a fast work. Lisa's Booby Trap had arrived. According to NYRA and the Albany Times-Union, Lisa's Booby Trap will probably run next on Travers Day, which is Saturday August 28, in the Grade 3 Victory Ride. Yesterday's blog story about the things that people see every day but don't stop to capture in photographs prompted Ada Gates to send in this photo from California. What do you see here? Two men in aprons. One working, one watching, right? "Here's my shed row picture," Ada wrote. "The apprentice learning from his boss farrier. I just thought it was sweet, and thankful the learning goes on." This is a timeless pose; apprentices have stood just like that with their hands on their knees for hundreds of years. Farrier apprentices aren't supposed to blink. Thanks, Ada! Double-click on the photo for a larger view. I've had this photo on my mind for a while, and I wanted to write a story to go with it. It seems to warrant one. It's at the San Antonio Rose Palace in San Antonio, Texas. The way I see it, two things could be going on: the farrier is waiting for a customer who is late (you know the farrier isn't early), or that's not the farrier stretched out in that chair, that's the customer, and she's waiting for the farrier, who unhitched his truck from the trailer to go get some lunch and hasn't been heard from since (and that was a long time ago). We always see photos of farriers working, bending, pounding, and clinching but rarely do we see them in one of those rare down-time moments. Even more rare is a completely still shot of a typical moment of a typical summer day at a showground that includes a farrier, since the farrier is usually in great demand and resembles a perpetual motion machine. People don't usually take pictures of the moments when nothing's going on. But that's the essence of a summer day: things just seem to stand still, if you let them. And summer lasts longer, if you do. This is what you might see when you come around the corner of any barn aisle across the USA today, tomorrow, this weekend and for the next month or so until the start of school and the coming cold weather chases everyone back home, so they can rest up and do it again next year. This quietest of all farrier scenes was captured by Houston-area photographer Louis Vest, who is more at home aboard a ship than on or under a horse, but anything that he points his camera at is better for it. Louis is a ship's pilot in the Houston Ship Channel and travels the world. He has an amazing array of photographs (especially if you like the sea, which I do) on display at his Flickr.com site. Thanks, Louis.